Several months ago I decided to peruse a new antique store in our area. 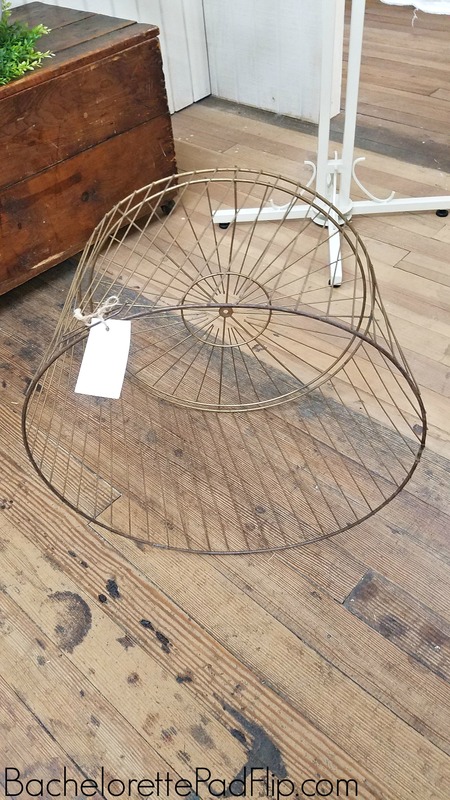 While there, I stumbled on a vintage, industrial metal basket. It was perfect–aged patina, large, and had the original metal handles. It was a bit more than I would typically spend– around $40ish, but I knew it had some potential with a new life! I didn’t want to paint the basket. I wanted to keep it in its original condition. While I wanted to use this as a basket, I wanted it to function as more than a storage basket. So I took it to Uncle Nuny’s workshop for him to work some magic. 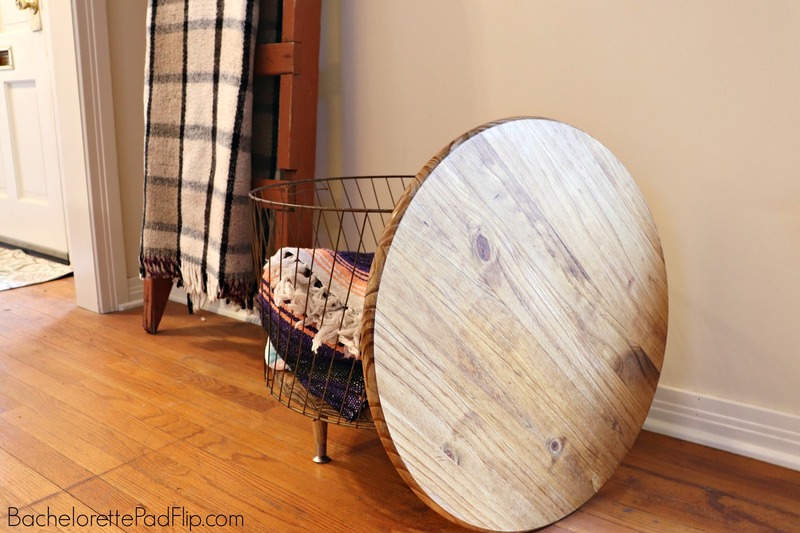 I wanted this basket turned into a table! And he delivered…as always! So how’d we do it? I purchased two of the pine discs that I used for the DIY Coffee Bar. Both were too large, but Uncle Nuny trimmed them down. We used one of the discs to go inside the basket as a base. 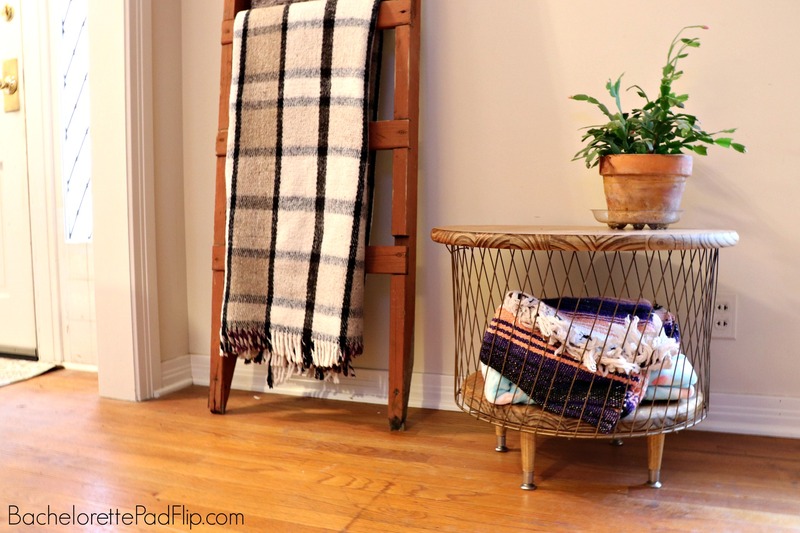 I needed a base for two reasons: To attach legs to them and To cover the bottom of the basket so there was a smooth surface to store blankets (I didn’t want blankets to get caught and torn). 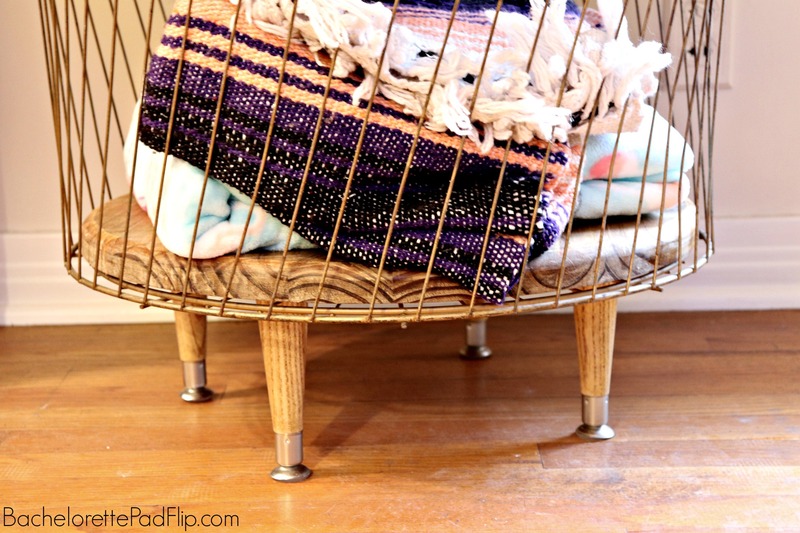 The bottom disc was placed at the bottom of the basket, and then we attached small midcentury legs. I purchased these at Lowe’s for around $2 each. The top disc serves as the top of the table. I didn’t want the top to be permanent. My goal was to use the table as storage, so I wanted to be able to easily lift off the table top to store blankets inside. 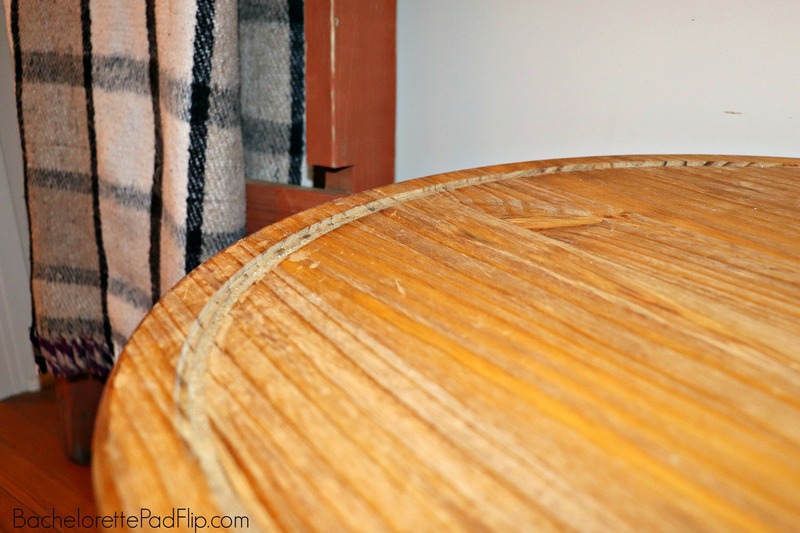 The wooden discs come as raw wood, so Uncle Nuny stained and sealed both of them. The last feature Uncle Nuny did on the top disc was to create a notched area so the top would rest securely on top of the basket. I didn’t want the disc to just sit on top of the basket. I wanted it to be secure. So the underside of the disc has a notched area around the edge for that purpose. Aside from the basket, I spent about $30 on materials. I loved how this turned out and how functional it is! I’m using it to store blankets, but it could be used to store magazines, toys, pillows, etc. In small spaces, like Flip 5, creative storage is essential! I also have to show off my latest curbside find. That rustic ladder was at the curb in my parents’ neighborhood, so I immediately swooped it up. 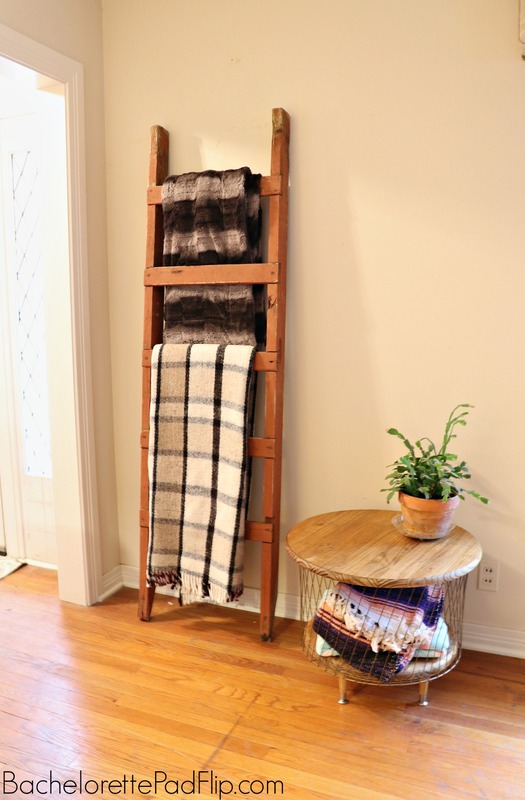 Blanket ladders are all over Pinterest, and while they aren’t difficult to make, who doesn’t love a free premade one? I gave it a good cleaning, sanding, and removed all the nails and tightened the screws and she’s all ready! I now have two possible areas to store blankets! I love simple easy projects, and Uncle Nuny is always a good sport. He called this project the “basket case”– and the basket case turned out really well, don’t you think? Your Christmas Cactus looks Fabulous!!! Genius!! 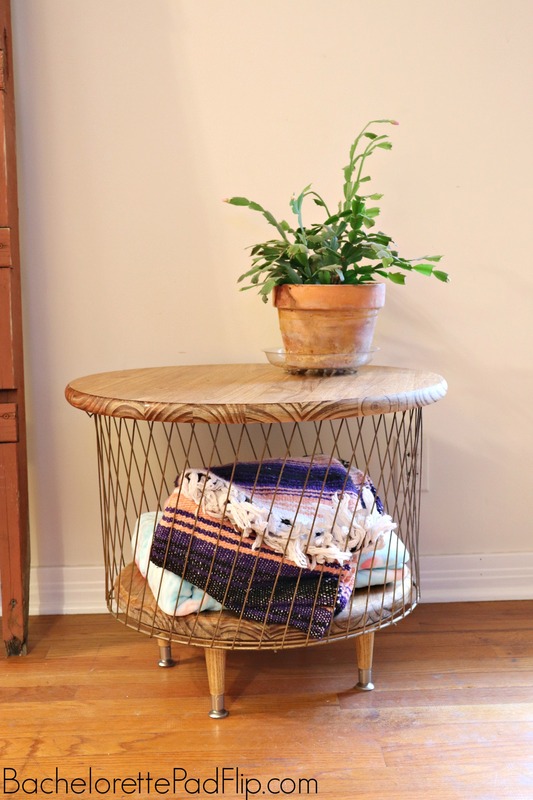 This basket table is wonderful, and the ladder:free and fabulous. Seriously, your uncle has skills! Great idea! Really like it. Inspired by this idea! Can you share dimensions of basket and completed table height? Thank you.